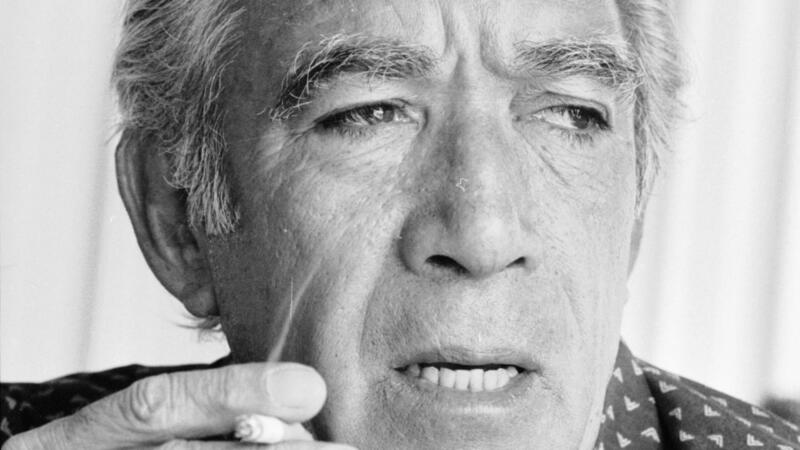 Anthony Quinn was born Antonio Rudolfo Oaxaca Quinn on April 21, 1915, in Chihuahua, Mexico, to an Irish-Mexican father and a Mexican mother. After starting life in extremely modest circumstances in Mexico, his family moved to Los Angeles, California, where he grew up in the Boyle Heights and the Echo Park neighborhoods. In Los Angeles he attended Polytechnic High School, and later Belmont High, but he eventually dropped out. 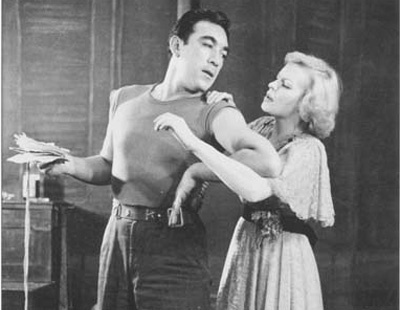 The young Quinn boxed (which stood him in good stead as a stage actor, when he played Stanley Kowalski to rave reviews in Chicago), then later studied architecture under Frank Lloyd Wright at the great architect’s studio, Taliesin, in Arizona. Quinn was close to Wright, who encouraged him when Quinn decided to give acting a try. After a brief apprenticeship in theatre, Quinn hit Hollywood in 1936 and picked up a variety of small roles in several films at Paramount, including as an Indian warrior in The Plainsman (1936), which was directed by the man who later became his father-in-law, Cecil B. DeMille. 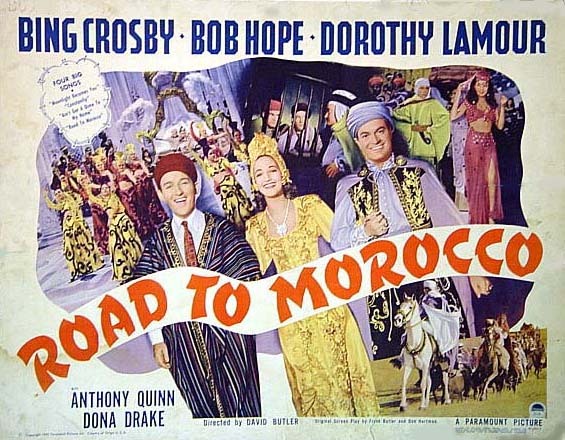 As a contract player at Paramount, Quinn mainly played villains and ethnic types, such as an Arab chieftain in the Bing Crosby-‘Bob Hope’ vehicle Road to Morocco (1942). As a Mexican national (he did not become an American citizen until 1947), he was exempt from the draft. With many actors in the service fighting World War II, Quinn was able to move up into better supporting roles. He had married DeMille’s daughter Katherine DeMille, which enabled him to move in the top circles of Hollywood society. He became disenchanted with his career and did not renew his Paramount contract despite the advice of others, including his father-in-law (whom Quinn felt never accepted him due to his Mexican roots). Instead, he returned to the stage to hone his craft. His portrayal of Stanley Kowalski in “A Streetcar Named Desire” in Chicago and on Broadway (where he replaced the legendary Marlon Brando, who is forever associated with the role) made his reputation and boosted his film career when he returned to the movies. Brando and Elia Kazan, who directed “Streetcar” on Broadway and on film, were crucial to Quinn’s future success. Kazan, knowing the two were potential rivals due to their acclaimed portrayals of Kowalski, cast Quinn as Brando’s brother in his biographical film of Mexican revolutionary Emiliano Zapata, Viva Zapata! (1952). Quinn won the Best Supporting Actor Academy Award for 1952, making him the first Mexican-American to win an Oscar. It was not to be his lone appearance in the winner’s circle: he won his second Supporting Actor Oscar in 1957 for his portrayal of Paul Gauguin in Vincente Minnelli‘s biographical film of Vincent van Gogh, Lust for Life (1956), opposite Kirk Douglas. Over the next decade Quinn lived in Italy and became a major figure in world cinema, as many studios shot films in Italy to take advantage of the lower costs (“runaway production” had buffeted the industry since its beginnings in the New York / New Jersey area since the 1910s). He appeared in several Italian films, giving one of his greatest performances as the circus strongman who brutalizes the sweet soul played by Giulietta Masina in her husband Federico Fellini‘s masterpiece The Road(1954). Alternating between Europe and Hollywood, Quinn built his reputation and entered the front-rank of character actors and character leads. He received his third Oscar nomination (and first for Best Actor) for George Cukor‘s Wild Is the Wind (1957). He played a Greek resistance fighter against the Nazi occupation in the monster hit The Guns of Navarone (1961) and received kudos for his portrayal of a once-great boxer on his way down in Rod Serling‘s Requiem for a Heavyweight (1962). 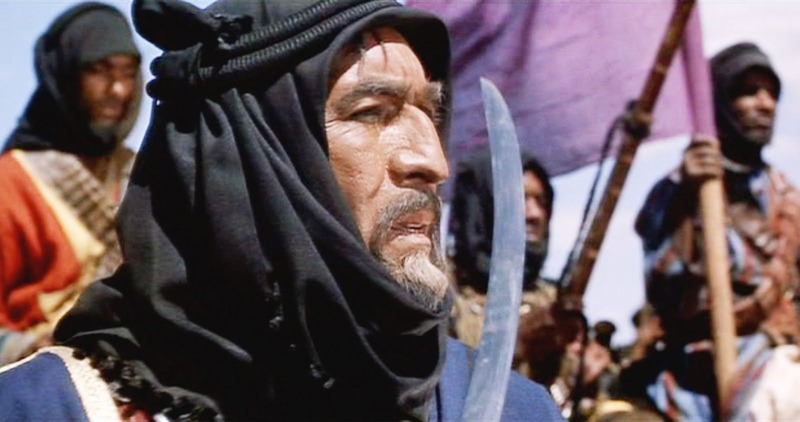 He went back to playing ethnic parts, such as an Arab warlord in David Lean‘s masterpiece Lawrence of Arabia (1962), and he played the eponymous lead in the “sword-and-sandal” blockbuster Barabbas (1961). Two years later he reached the zenith of his career, playing Zorba the Greek in the 1964 film of the same name (a.k.a. 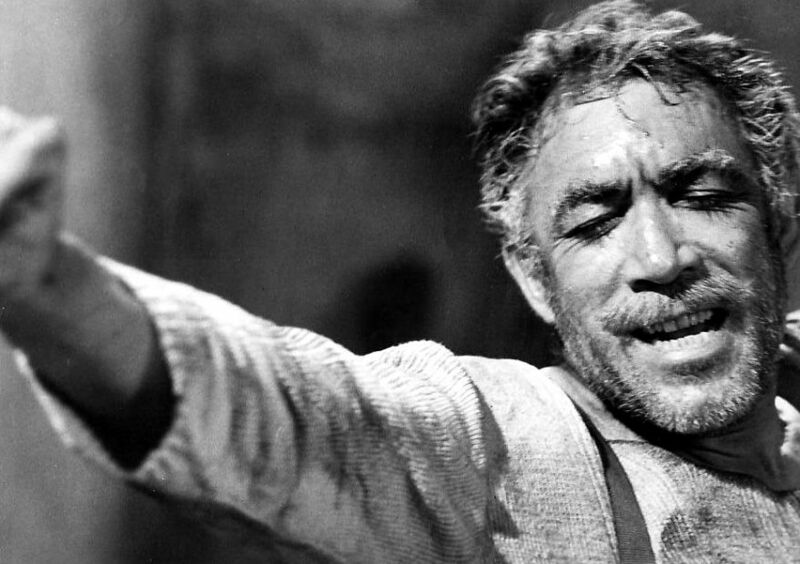 Zorba the Greek(1964)), which brought him his fourth, and last, Oscar nomination as Best Actor. The 1960s were kind to him: he played character leads in such major films as The Shoes of the Fisherman (1968) and The Secret of Santa Vittoria (1969). However, his appearance in the title role in the film adaptation of John Fowles‘ novel, The Magus (1968), did nothing to save the film, which was one of that decade’s notorious turkeys. In the 1960s Quinn told Life magazine that he would fight against typecasting. Unfortunately, the following decade saw him slip back into playing ethnic types again, in such critical bombs as The Greek Tycoon (1978). He starred as the Hispanic mayor of a southwestern city in the short-lived 1971 TV series The Man and the City (1971), but his career lost its momentum during the 1970s. Aside from playing a thinly disguised Aristotle Onassis in the cinematic roman-a-clef “The Greek Tycoon”, his other major roles of the decade was as Hamza in the controversial 1977 movie The Message(1977) (a.k.a. “Mohammad, Messenger of God”, as the Italian patriarch in The Inheritance (1976), yet another Arab in Caravans (1978) and a Mexican patriarch in The Children of Sanchez (1978). In 1983 he reprised his most famous role, Zorba the Greek, t on Broadway in the revival of the musical “Zorba”, for 362 performances. Though his film career slowed during the 1990s, he continued to work steadily in films and television.